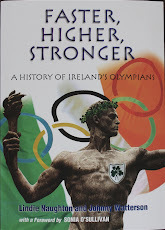 Irish Olympians - Faster, Higher, Stronger: Athletics: What's It All About? Watching Usain Bolt of Jamaica win the men's 100m, the BBC commentators admit they are at a loss for words. The man has won the race slowing down - and still broken his own world record with a stunning time of 9.68. They then show endless minutes of footage of him "show-boating" - in their words. The greatest race ever? H'mmm. Why then do I feel a bit sick? Likewise with the women's 10,000m - Dibaba running faster than anyone except the disgraced Chinese (who then made a brief appearance at the orienteering event but that's another story) and finishing ahead of a very suspect Turk. Why do the commentators drool and take what they see at face value? I am absolutely certain that informed viewers don't. So if we can't accept that men and women run that fast or that far on their own steam, what future for the sport? What a relief that we Irish have sportsmen like Eoin Rheinisch, Scott Evans and Chloe Magee as well as the boxers to celebrate. We can only offer our sympathy to our brave athletes, who are truly up against it in what has become a very nasty sport. In a bi-partisan move to blow away the clouds of suspicion and criticism, the Jamaican senate on Friday passed our country’s first anti-doping law. Jamaica has been under recent scrutiny most noticeably from the international media about the lack of out of competition drug testing and over all anti-doping laws. At least this will help boast public confidence and maybe ease some worried minds. With Jamaica taking two of the fastest sprinters to Beijing we can still expect more scrutiny and jealous bias reports. Other than that, this is good for Jamaican sports. The Anti-Doping in Sport Act, 2008, received unanimous support from the Senate yesterday; days after the House of Representatives gave the bill the green light. Attorney General and Leader of Government Business in the Senate, Dorothy Lightbourne, piloted the bill, which will facilitate the setting up of the Jamaica Anti-Doping Com-mission. The agency will be responsible for regulating and controlling doping in sport locally. According to Senator Lightbourne, the decision by Government to enact legislation to establish the commission, followed its adoption of the World Anti-Doping Programme and the World Anti-Doping Code. A.J. Nicholson, leader of Opposition business in the Senate, said Jamaica was now at the pinnacle of its achievements in athletics, with the country boasting the two fastest men in the world - Usain Bolt and Asafa Powell. He highlighted the consequences of breaching the anti-doping rules, pointing out that athletes could be slapped with disqualification or suspension. Athletes could be tested for illegal drugs at least 12 hours before participating in an event, he added. Nicholson also commented on the importance of the commission, noting that if the integrity of this body was called into question it could deal a devastating blow to the Jamaican sporting fraternity. However, he said for decades Jamaica has had sport administrators of unquestionable character. Government Senator Don Wehby lauded the country’s athletes for their excellent performances, which have been a source of pride for Jamaica. He defended the integrity of Jamaica’s athletes and castigated “misguided and poorly informed commentators” who have stopped short of saying Caribbean athletes were using performance-enhancing drugs.